Here, the five-headed Tripurantaka is seen pointing an arrow towards the Tripura (rightmost top corner) with the bow made of mount Meru, the serpent Vasuki is seen as its string. The four-headed god Brahma is seen. The moon and the Sun are depicted as the wheels of the chariot. Tripuri Purnima or Tripurari Purnima derives its name from Tripurari - the foe of the demon Tripurasura. In some legends of Kartik Purnima, the term is used to denote the three demon sons of Tārakāsura. Tripurari is an epithet of god Shiva. Shiva in his form as Tripurantaka ("Killer of Tripurasura") killed Tripurasura on this day. Tripurasura had conquered the whole world and defeated the gods and also created three cities in space, together called "Tripura". The killing of the demon(s) and destruction of his/their cities with a single arrow - by Shiva overjoyed the gods and they declared the day as a festival of illuminations. This day is also called "Dev-Diwali"—the Diwali of the gods. Diwali is the Hindu festival of lights. Kartik Purnima is also the birthday of Matsya, god Vishnu's fish-incarnation (avatar). It is also the birthday of Vrinda, the personification of the Tulsi plant and of Kartikeya, the god of war and son of Shiva. This day also is considered special for Radha, the lover of Krishna - Vishnu's incarnation. It is believed that Krishna and Radha danced rasa and Krishna worshipped Radha on this day. This day is also dedicated to the pitrs, dead ancestors. Underhill believes that the origins of this festival may lie in ancient times, when a sacrifice called Shakamedhah was performed to attain victory over enemies. The festival has even more significance when the day falls in the nakshatra (lunar mansion) Krittika and is then called Maha Kartik. The nakshatra is Bharani, the results are stated to be special. If it is Rohini nakshatra, then the fruitful results are even much more. Any philanthropic act on this day is supposed to bring benefits and blessings equal to the performing of ten yajnas (sacrifices). Kartik Purnima is closely associated with Prabodhini Ekadashi which marks the end of Chaturmas, a four-month period when Vishnu is believed to sleep. Prabodhini Ekadashi signifies the awakening of the god. Chaturmas penance ends on this day. Many fairs that begin on Prabodhini Ekadashi end on Kartik Purnima, Kartik Purnima usually being the most important day of the fair. Fairs that conclude on this day include Prabodhini Ekadashi celebrations at Pandharpur and Pushkar Fair. Kartik Purnima is also the last day to perform Tulsi Vivah ceremony that can be performed from Prabodhini Ekadashi. Also, it is believed that Vishnu, on this day, returns to his abode after completing his stay in Bali. Hence, the day is known as Deva-Diwali. In Pushkar, Rajasthan, the Pushkar Fair or Pushkar mela commences on Prabodhini Ekadashi and continues till Kartik Purnima, the latter being the most important. This fair is held in honour of god Brahma, whose temple stands at Pushkar. A ritual bath on Kartik Purnima in the Pushkar Lake is considered to lead one to salvation. It is believed circling the three Pushkars on Kartik Purnima is highly meritorious. Sadhus gather here and stay from ekadashi to full moon day in caves. About 200,000 people and 25,000 camels assemble in Pushkar for the fair. Pushkar fair is Asia's largest camel fair. A ritual bath at a tirtha (a sacred water body like a lake or river) at a pilgrimage centre is prescribed on Kartik Purnima. This holy bath is known as "Kartik snana". An holy bath at Pushkar or in the Ganges river, especially at Varanasi is deemed as most auspicious. Kartik Purnima is the most popular day for bathing in the Ganges at Varanasi. The devotees also take a bath in the evening during moonrise and offer worship by way of six prayers such as Shiva sambuti, Satait and so forth. Annakuta, an offering of food to the deities, is held in temples. People who have taken vows on Ashvin full moon day, end them on Kartik Purnima. God Vishnu is also worshipped on this day. Any form of violence (hinsa or himsa) is prohibited on this day. This includes shaving, hair-cutting, cutting of trees, plucking of fruits and flowers, cutting of crops and even, sexual union. Charity especially donation of cows, feeding of Brahmins, fasting are religious activities prescribed for Kartik Purnima. Giving gift of gold is said to fulfill all desires of people. Tripuri Purnima is only next to Maha Shivaratri, amongst festivals dedicated to Shiva worship. To commemorate the killing of Tripurasura, images of Shiva are carried in procession. Temple complexes in southern India are lit up throughout the night. Deepmalas or towers of lights are illuminated in temples. People place 360 or 720 wicks in temples, to secure escape reaching hell after death. The 720 wicks symbolizes the 360 days and nights of the Hindu calendar. In Varanasi, the ghats come alive with thousands of diyas (brightly lit earthen lamps). People gift lamps to priests. The lamps are kept throughout the night in houses and Shiva temples. This day is also known as "Kartik Diparatna" - the jewel of lamps in Kartik. Lights are also floated in miniature boats in rivers. Lights are placed under Tulsi, Sacred fig and Amla trees. The lights in the water and under trees are believed to help fishes, insects and birds who saw the light to attain salvation. In Odisha, on Kartik Purnima, people celebrate Boita Bandana(odia: ବୋଇତ ବନ୍ଦାଣ) by heading for the nearest water body to set afloat miniature boats, originally made out of banana stem and coconut stick, lit with deepak(lamps), fabric, betel leaves. Boita stands for boat or ship. The festival is a mass commemoration of the state's glorious maritime history when it was known as Kalinga and tradesmen and mariners known as sadhabas traveled on boitas to trade with distant island nations that share borders with the Bay of Bengal like Indonesia, Java, Sumatra and Bali. People in Odisha celebrate Kartik Purnima by setting afloat miniature boita (boats) made from banana stem to remember the historical significance of the day. In Tamil Nadu, Karthikai Deepam is celebrated where the Purnima corresponds to the Krittika nakshatra. People light rows of lamps on their balconys. In Tiruvannamalai, a ten-day annual festival is held to celebrate Karthikai Deepam. In Telugu households of Andhra Pradesh, Telangana, Karthika maasalu (month) is considered very auspicious. The Kartika month starts on the day of Deepawali. From that day till the end of the month, oil lamps are lit every day. On Karthika Pournami (full moon of Kartheeka month) oil lamp with 365 wicks, prepared at home, are lit in Lord Shiva temples. Apart from that, Kartika puranam is read and fasting is observed till sunset, every day for the whole month. Swaminarayan Sampraday also celebrates this day with faith and fervor. Kartik Purnima is an important religious day for Jains who celebrate it by visiting Palitana a Jain pilgrimage centre. 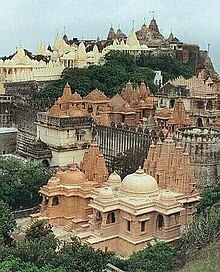 Thousands of Jain pilgrims flock to the foothills of Shatrunjay hills of Palitana taluka on the day of Kartik Purnima to undertake the auspicious yatra (journey). Also known as the Shri Shantrunjay Teerth Yatra, this walk is an important religious event in the life of a Jain devotee, who covers 216 km of rough mountainous terrain on foot to worship at the Lord Adinath temple atop the hill. Considered to be a very auspicious day for Jains, the day also assumes more significance for the walk, as the hills, which are closed to the public during the four months of Chaturmas, are thrown open for the devotees on Kartik Purnima. The day of Kartik Purnima is very significant in Jainism. As devotees are kept away from worshipping their lord for four months of the monsoon season, the first day attracts the maximum number of devotees. Jains believe that Adinath, the first tirthankara, sanctified the hills by visiting it to deliver his first sermon. According to Jain texts, millions of sadhus and sadhvis have attained salvation on these hills. There are no auspicious days in Sikhism. Any month, day or moment a person remembers the Divine is considered auspicious. Guru Nanak was born on 1 Vaisakh, April 14, according to the (Sikh) Nanakshahi calendar. It happened to be a full-moon night.Nanakpanthi Hindus and other followers of Guru Nanak's philosophy celebrate this festival on Kartik Purnima, according to the (Hindu) Bikrami calendar. Kartik Purnima is celebrated as Gurupurab or Prakash Parva that is Guru Nanak Jayanti Worldwide. ^ "2017 Marathi Panchang Calendar". Retrieved 22 October 2016. ^ a b Garavi gujarat. p. 11. ^ a b c Dwivedi, Dr. Bhojraj (2006). Religious Basis Of Hindu Beliefs. Diamond Pocket Books (P) Ltd. p. 171. ISBN 9788128812392. Retrieved 7 November 2012. ^ a b "Pilgrims flock Palitana for Kartik Poornima yatra". The Times of India. 2 November 2009. Retrieved 3 November 2009. ^ "Guru Nanak's birth date" (PDF). This page was last edited on 15 March 2019, at 14:04 (UTC).